People who live in apartments or those who own a small piece of property might assume that having a functional outdoor space is not an option for them. However, even small patios can transform into a fun place to hang out with family and friends or entertain guests with the proper planning. 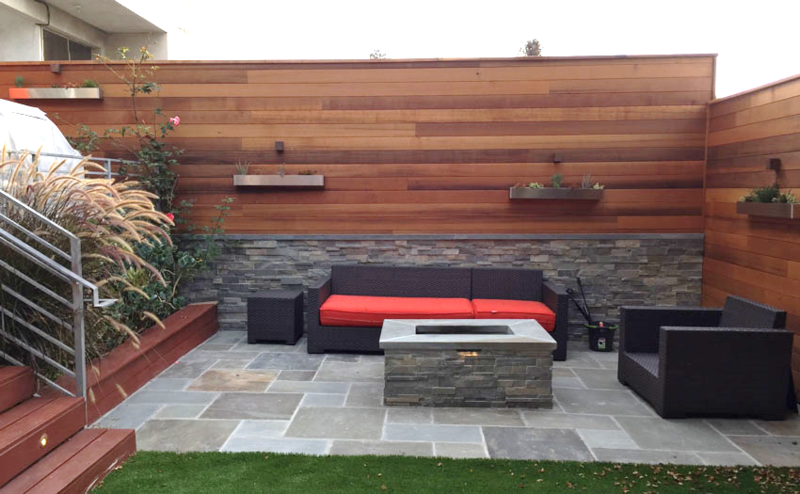 The biggest thing to remember when planning to fill in a small outdoor space is that less is more. Trying to fit too many large pieces of furniture and decorations or overgrown plants will only make the space look crowded and feel uncomfortable. Long furniture with a boxy shape usually doesn’t work well in a limited space. It could even block the entrance to the patio or present a tripping hazard. Curved furniture fits into small spaces better while providing the same number of seating options. It’s also safer in small enclosed spaces because people are less likely to bump into the furniture or stumble over it. This furniture design is also quite stylish. Traditional lamps that sit on an end table or lamps that stand on their own can take up too much space in a small patio. A better alternative is to install hanging lamps in the ceiling to illuminate the area without taking up any floor space. This can also create the impression that the room has more available space than it actually does. Of course, it’s only an option in an enclosed patio. The style that homeowners choose for the ground of a non-enclosed patio makes all the difference in its overall aesthetics. The tumbled paver can create a look that is both simple and timeless. Homeowners should consider in advance whether they prefer specific angles, cuts, or patterns with the pavers as each request affects the total cost. Considering that the whole purpose of having outdoor space is to relax and enjoy the company of others, it makes sense to choose understated patterns and colors for the flooring to help achieve this goal. Sitting outdoors surrounded by natural beauty has a calming effect on most people. Homeowners who already have plant and flower growth in areas of the backyard can take advantage of this and have the patio constructed around it. Adding a stone wall and two to four steps helps to provide greater dimension to the space while retaining its natural features. It can take a bit of creative thinking to form the ideal outdoor space without breaking the budget. One easy way to achieve both goals is to include pieces that the homeowner can use for more than one purpose. For example, a desk can transform into a buffet when entertaining guests and a bench can easily convert into a coffee table. Coming up with new ideas for existing pieces can be a fun and creative game for the whole family. The effort it takes to create a workable outdoor area for relaxation and entertainment will be well worth it on those warm summer nights when no one wants to go inside just yet.